Girls Assault with Deeny Suarez! Girls Assault is a girls only skate website over in Argentina, founded by Daniela Suarez (Deeny) and her friend Daniela Quintabani in October of 2007. 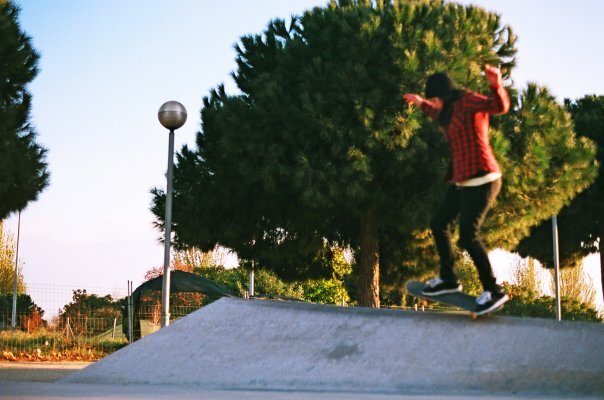 The website was born out of a passion to skate, to meet new friends and have fun. The website aims to bring together girls and also encourage new girls to participate and to join riders from all over the world. Together, they hold events, competitions and girls only skate days at their local park in order to get the girls skating together without being intimidated. Check out these edits from a couple of the Girls Assault events in Argentinia! Hey Deeny! 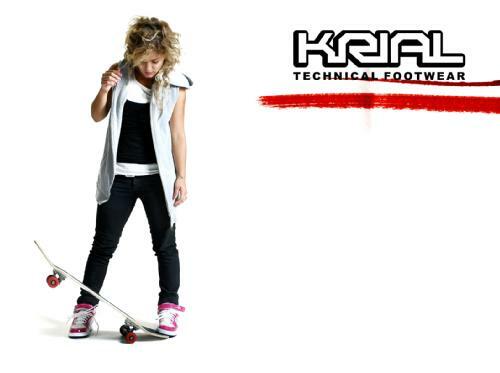 Your site, Girls Assault in Argentinia is the biggest for girls skateboarding isn’t it? How did you build up such a fan base and get the word out about it? Hey Danni! I really do not know if it’s the biggest, but it is the only women’s event in Argentina that was created with so much heart and desire! This led to having a successful outcome. Thanks to this, today in Argentina there are many more girls skating, unlike when I started. They have their own place to skate and a girls only contest, you always feel comfortable. The level in Argentina is growing a lot so we set up the website to show some other girls the spots that are around South America to bring them together. I think when you are organized and things are made with love with your friends, and meeting new people, without expecting any monetary order, you can go far. You seem to put a lot of passion and effort in to this project, What is it that made you decide to start running the Girls Assault website? I got the idea after seeing how slowly the girls skate scene was growing in comparison to the boys. After talking to my colleague Daniela Quintabani, who is also a skater, we discussed the idea of making a female only skate event and she said she would help me do it, from there we began to build the road. So could you give us an example of an average day at one of the Girls Assault events? And why do you think they have been so successful amongst both the beginners and the girls who have been into it from the start? The event is to have the skatepark open just for girls in the morning, with an itinerary of activities. The assembly of the skateboard is taught first along with helpful tips, elongation of the muscles that we use to skate, and also clinics (lessons) are run by the team of Girls Assault. This is followed by a free track time to skate, a demo from the team and then we all have lunch, and give gifts to the girls who came. We did the first event on our own, but the second we did with Poseiden Tour, with the same route as previous events but this time we visited Vanessa Torres, Alisson Matassi, Sophie Poppe and Violet Kimble. Having recognized skaters like those at our events definitely helped us to do well as an establishment. We also added a Women’s Championship this time around and an Amateur Best Trick, getting 30 girls enrolled and a division within the category. From there we made over two years of events by including the Women’s Championships, with more girls. It just gets better and better! Rad! So is the girls skate scene in Argentinia big? And can you throw us some names of any skaters we may have heard of? Yes! the scene is very big, there are many girls that are learning and many are already doing very well in a short time. Some big names in the scene and internationally are Eugenia Ginepro and Paula Costales, they are also in the interview section on the Girls Assault website and thesideproject.com and they have parts in various Argentinian’s videos. 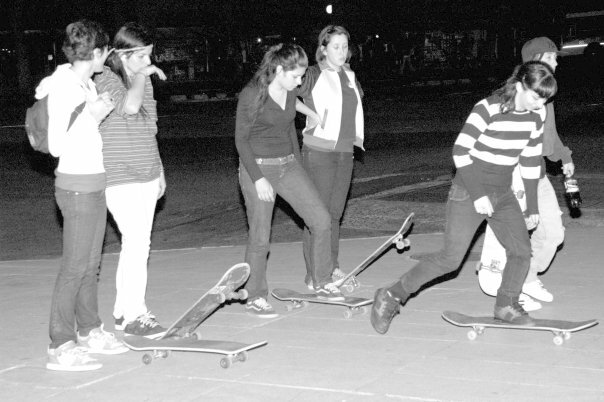 The female skate scene in Argentina is successfully growing and today at any spot at you can come across at least 7 girls skating. So, we decided to rearm the web with Daniela in Argentina and Me in Barcelona, it releases the information about the female skateboarding scene in Argentina to Europe and the also the Argentinians can know the European scene and surroundings. There are quite a few girls in Barcelona that are hooked up, most notably probably are the Wilshusen Twins, are any of the Argentinian girls sponsored? If so how did that come about? Sure! 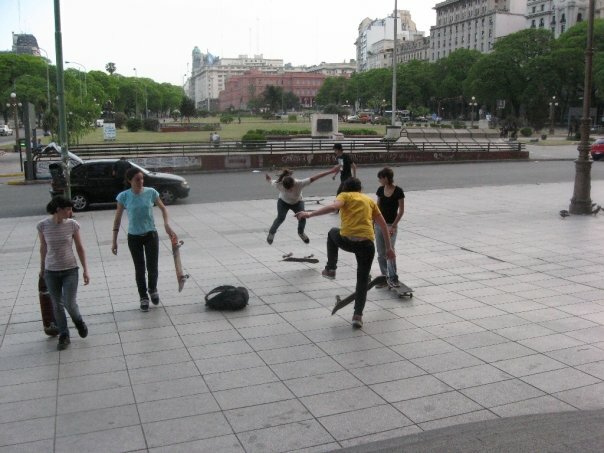 In Argentina, most brands are national and their owners are skaters. Then there are distributors of big brands such as Converse, Vans, Rip Curl, etc that also have its runners. You can see who they are later in a section profile of the Girls Assault website. There are a large group of girls sponsored, they receive clothes, accessories, shoes, etc … and some other times, though not so often, money to go to contests in other cities. 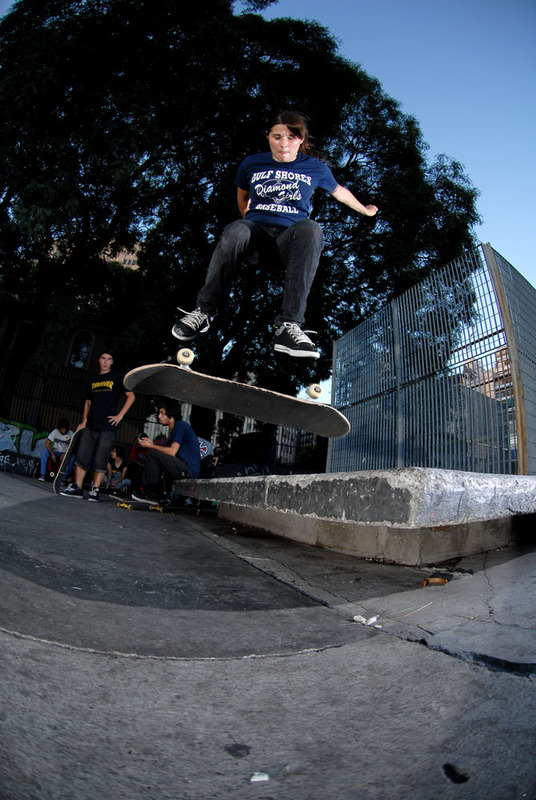 They receive sponsorship through various contests that are performed in both street and skateparks. (Park contests, Game of skate, Best trick in street, etc.). It sounds like the South American girls skate scene is really taking off! Are there any GIRLS ONLY teams or full length videos in the making? There aren´t any girl teams, but we in our website have a team with girls who have skated for a longer period of time or who evolve faster. These girls are helping us with the tasks of the events we do. GIRLS ASSAULT as you know is a female skate event with clinics for girls, teaching skateboard assembly, muscle elongation (stretches), demos and ending it all off with a contest with categories for the advanced and also for the beginners. 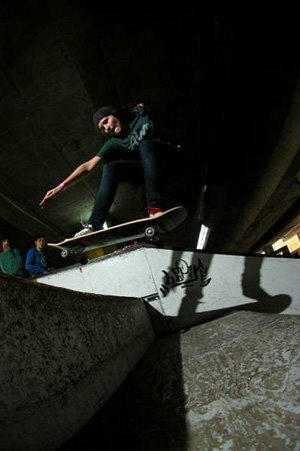 We have no female skate videos in Argentina, for now we can only see small parts of girls in the skate videos of guys and on our website. How do you get all of the information of everything happening in the scene? Do you do the research yourself; look online, attend contests etc. Or do people email you through news and results and new sponsorship information? I work with my skatepartner Daniela Quintabani, who in Argentina is my main informant of what happens there, or the same girls tell me about the contests and news so I know that happens in Argentina. There aren´t many events for girls now so it is not difficult to keep on top of, and the same few girls do the best tricks or games of skate in parks/spots and then give me the information results and photographs for the website. What is the main thing for you to achieve by running this site? Do you just want to get more girls involved in the sport, or do you want more girls competing to show they can do it aswell? Or is it just something you enjoy doing in your own time? My idea was always to help the women’s skate scene in my country to grow, and support the girls who want to get started. Now there are many girls skating, some with sponsorship and at a good level. Now with the website we can show the girls who are interested in skateboarding how to grow to their desired level, and help to encourage girls from other cities to skate by showing them what other girls can do. We think it is important for girls to meet other girls who skate and to be known within the same city or across the world. This builds great friendships and it is how I met a lot of my friends, now I skate with people I met on the net a longtime ago or just meet girls who like to do the same thing as me! The main idea is to show that in Argentina and South America the scene of girls skaters exist and bring together riders from all over the world. Anything else you want to mention while you’re here?